I looked down at La Mesa disapprovingly. It looked back up at me, all doe eyed and floral flanked. Hmm. 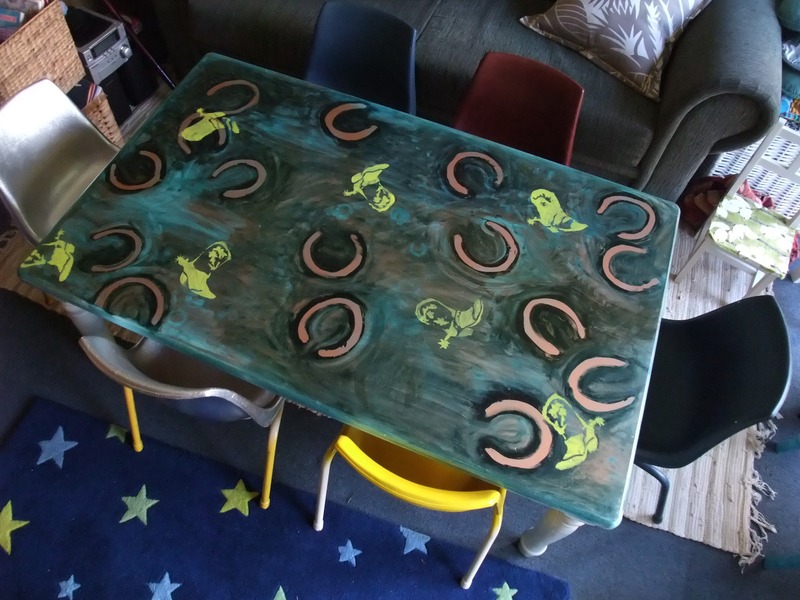 You do not do, you do not do, anymore black shoe (aptly put Sylvia Plath), however I am not talking about a black shoe, but a mesa…a table… specifically my daughter’s craft table. Appropriately whimsical when she was a toddler, her daily reminders of what a big girl she is, made me soon realize that it was time for a craft table makeover. 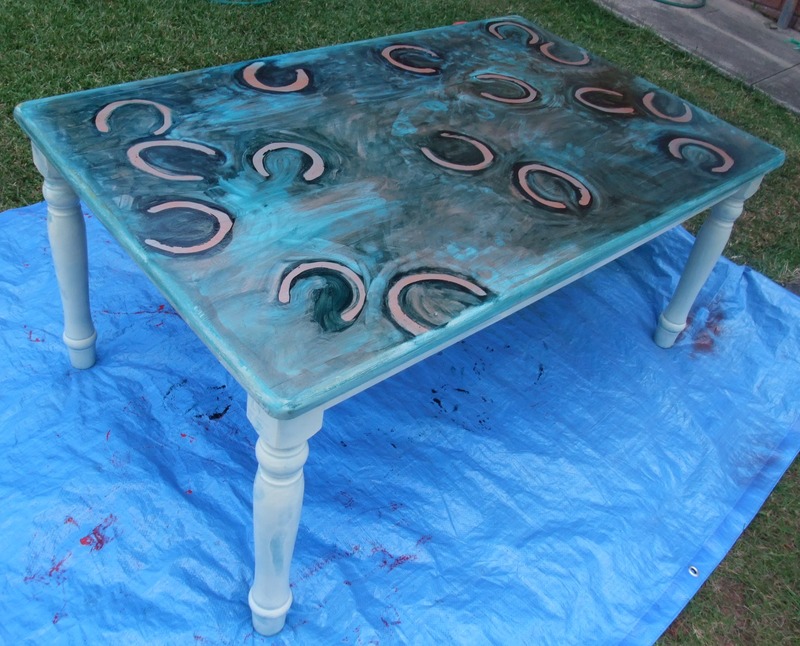 I refurbished this table about a year ago. As she will be sharing it with a brother within weeks, it manned up in the nick of time! 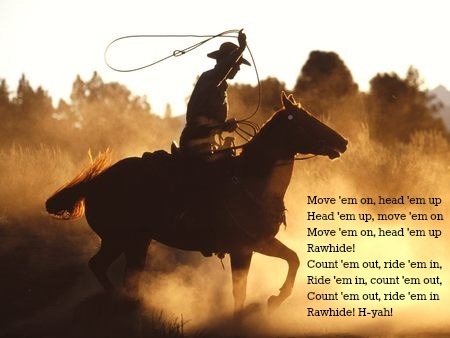 Out with the reindeer and in with the raw hide. 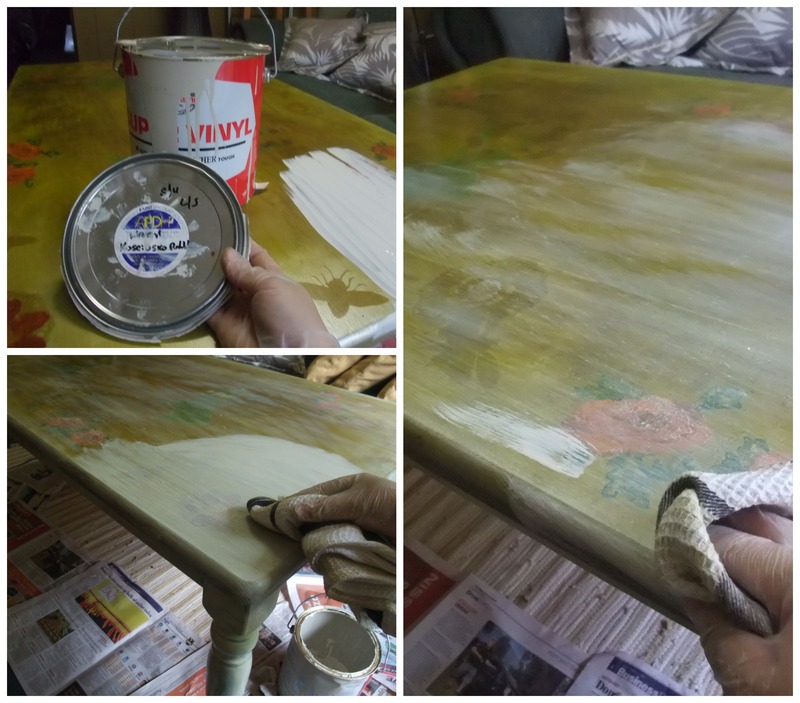 Firstly I painted the table top with left over house paint (Kosciusko Pebble) and rubbed it back to a light white colour before spraying with one coat of copper coloured spray paint. 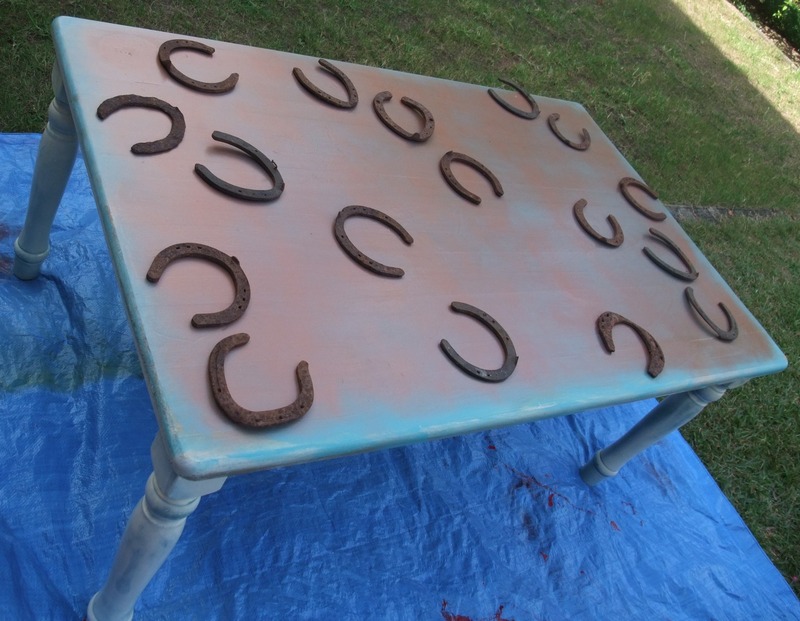 Randomly rested horse shoes on table surface. In the absence of real horse shoes, cardboard stencils would suffice. 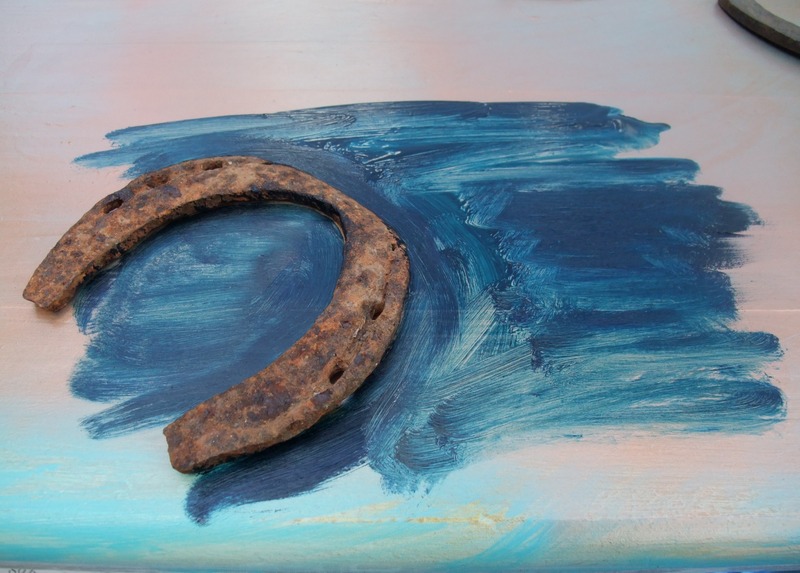 With thick brush strokes, painted dark blue oil paint round the horse shoes, diluting the paint with linseed oil for quicker and thinner coverage. Dabbed a cloth in methylated spirits and randomly rubbed back dark blue paint on table top here and there to reveal light blue and copper colours underneath. 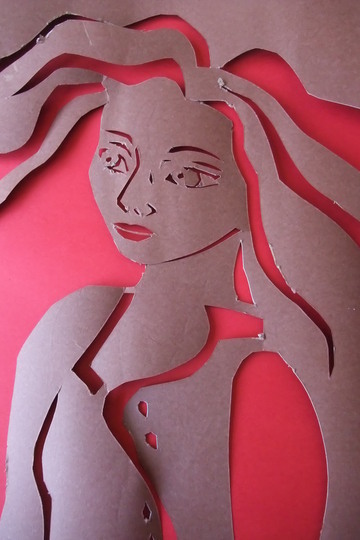 With a stencil knife and book covering contact, drew and cut out Yee-ha boots. 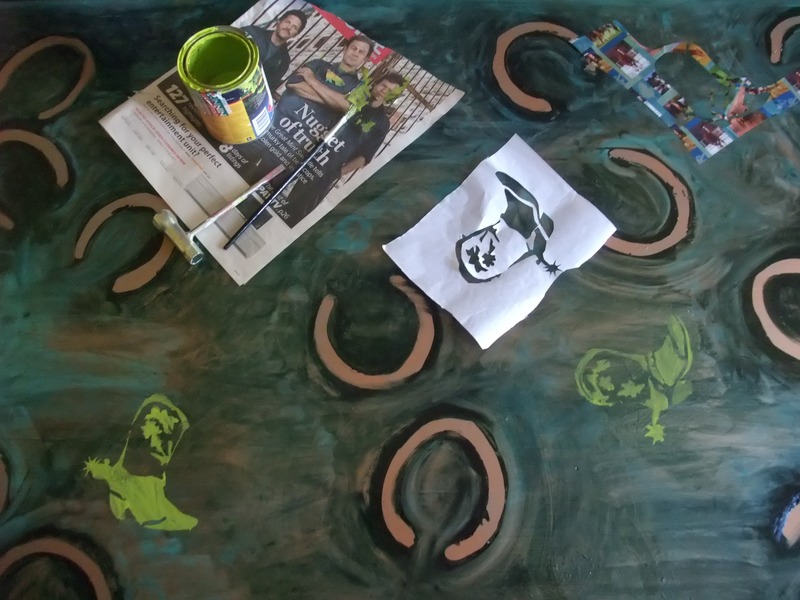 Peeled paper backing off and placed sticky side down onto clean and dry table surface before painting stencil in with lime green oil paint. Just add children and chairs. H-yah! 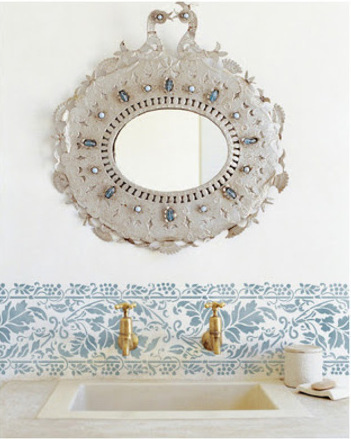 Categories: Art, Craft, Craft tutorial, DIY, Paint, Refurbishing, Spray paint, Stencil, totally tutorials, Uncategorized | Tags: Craft tutorial, decorate, DIY, Paint, Spray paint, Stencil | Permalink. 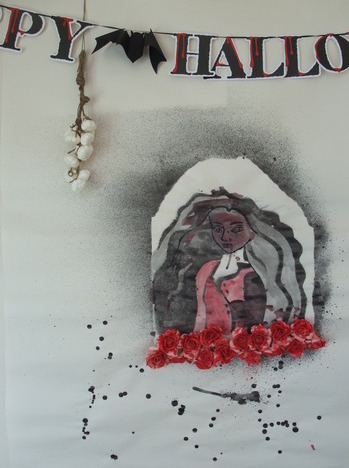 On February 24th Hazelhurst Gardens celebrated their 13th Birthday. 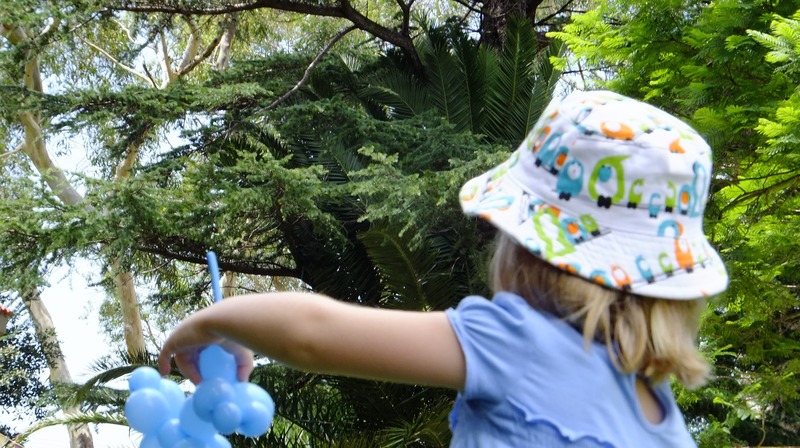 This place is a garden, cafe and regional gallery that hosts all sorts of interesting events, from Art Express to Children’s ceramics classes. 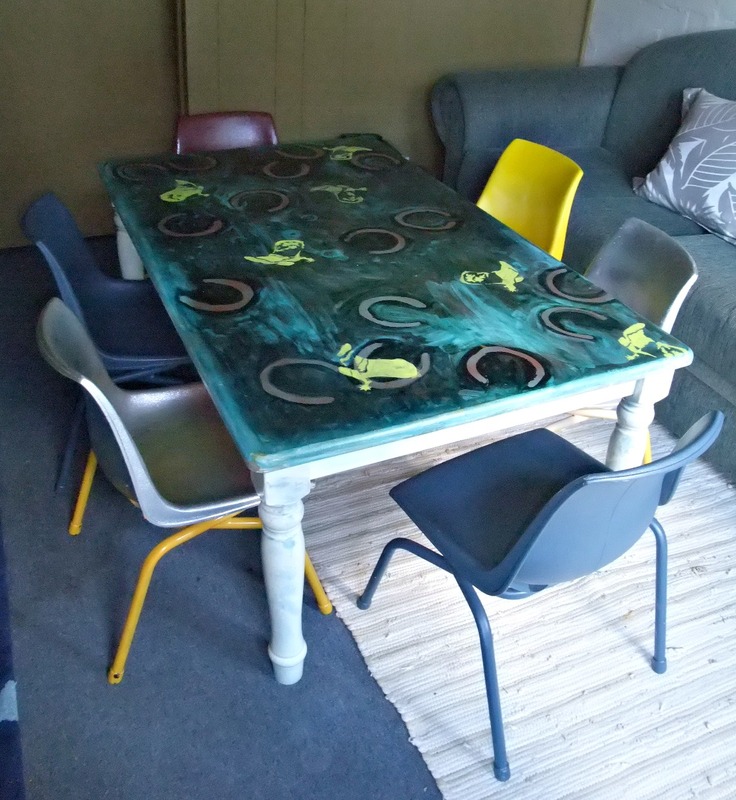 I was lured in by a spray painted mural by Beastman (see original post on “Spray Painting” my vintage patio chairs… https://speckledsydney.wordpress.com/2013/02/11/refurbishing-vintage-patio-chairs). 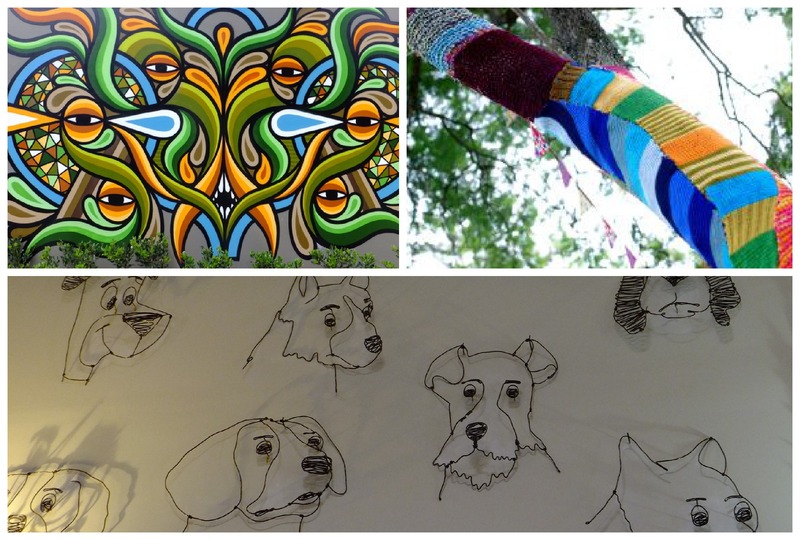 Was pleasantly surprised to see the mural and to find that the garden was kitted out in bright balloons, bunting, and a dozen yarn bombed trees! Fairy floss and mini cupcakes were in abundance. Reverse garbage had a tent for kids craft, clowns were balloon making, women were weaving and jazz was playing. 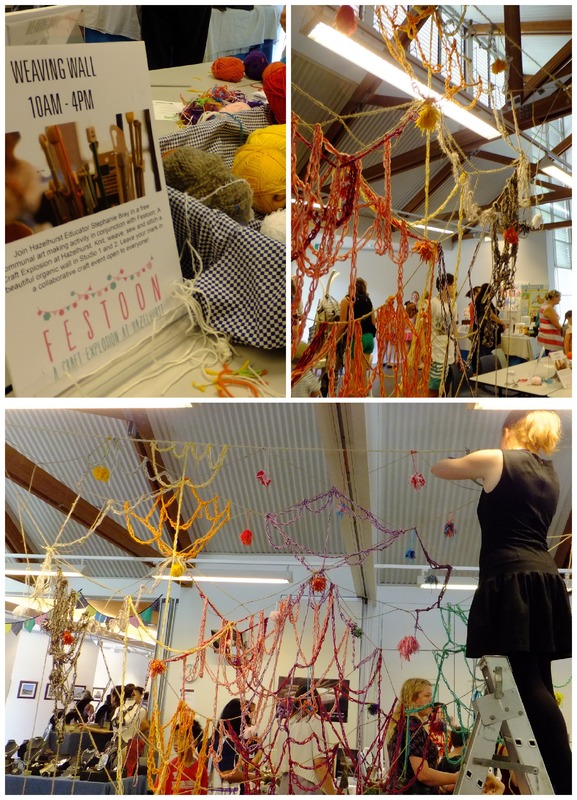 Inside, the gallery was filled with all manner of crafty people selling their wares and an interactive weaving wall. What a great place, we’ll be back again! 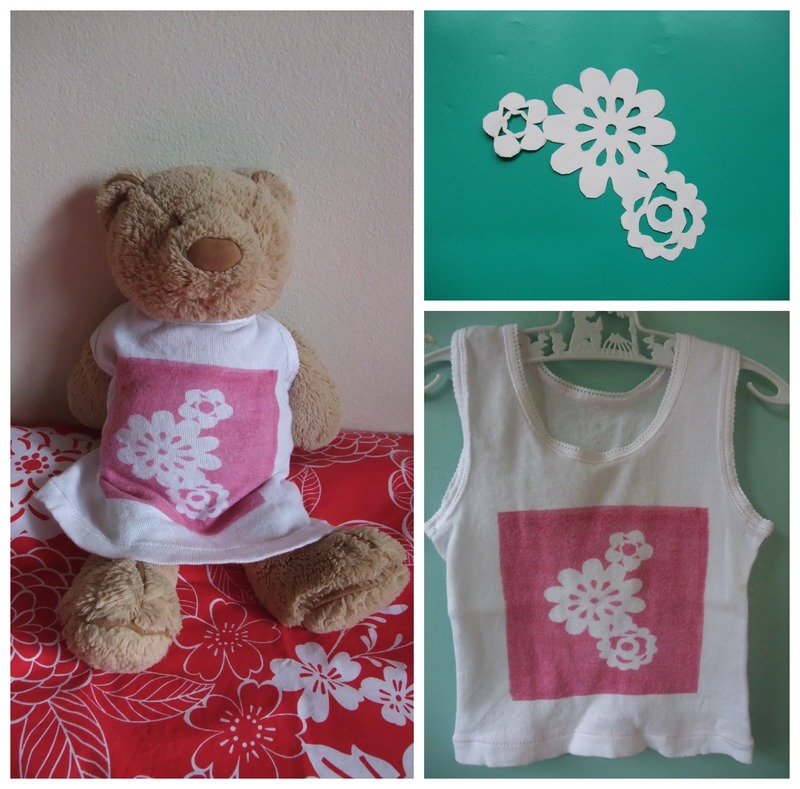 Categories: Art, Craft, Paint, Spray paint | Tags: craft, decorate, kids craft, Paint | Permalink. 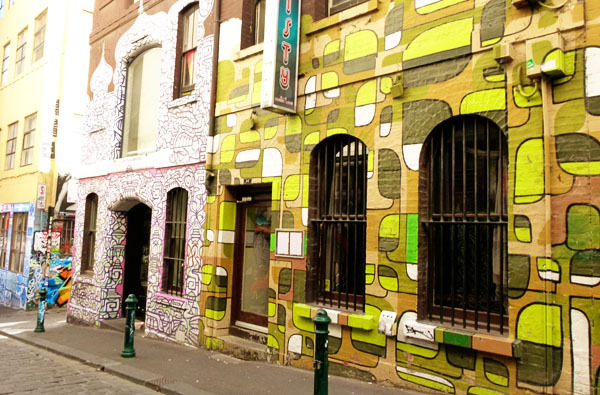 Recently in Melbourne we stumbled across Hosier Lane, walls filled with bright street art from sidewalk to skyline. 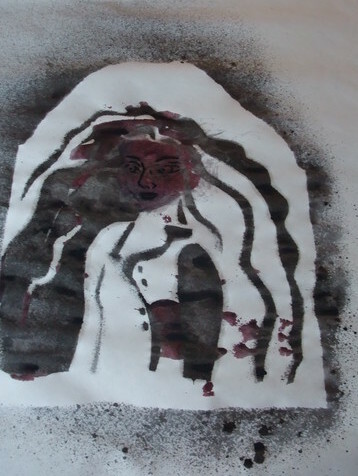 It’s amazing how transforming spray paint can be. And so, once again I find myself turning to killrust in a can. 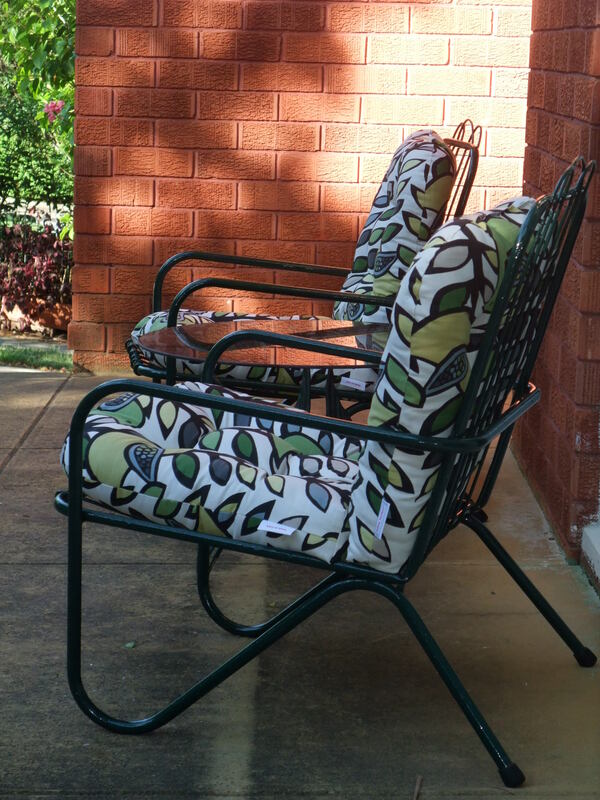 It’s extremely durable for spray painting outdoor furniture. I painted these vintage (50’s?) wrought iron chairs several months ago. 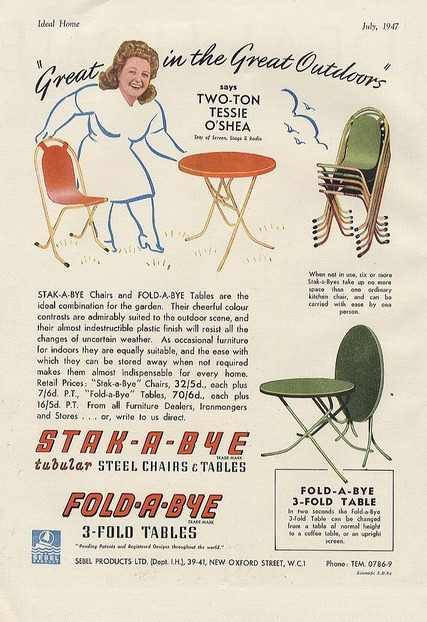 There were four Vintage Iron chairs in total; two tubs chairs and two rocking chairs. All were in a flaky and slightly rusted condition, so washed them then sanded them back to smooth surfaces. Spray painted them with one coat of Killrust in brown before painting 2 coats of liquid Killrust in Vintage Green. Until recently these chairs were a place where pillows went to die, foraged from sofas and armchairs. 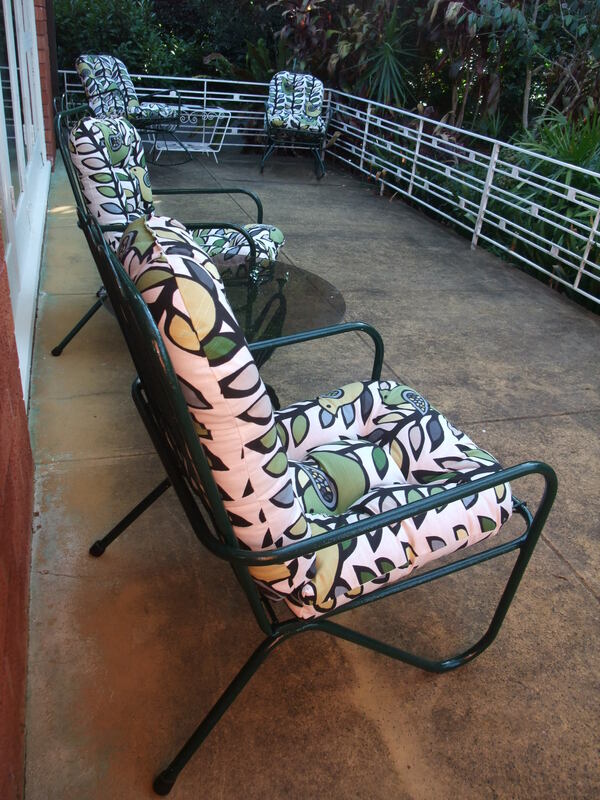 Now we have matching Pillow Perfect outdoor cushions in a retro birds and vines print. These puppies are plush! 5 inches of padding and a beverage of choice make for a perfect weekend spot. 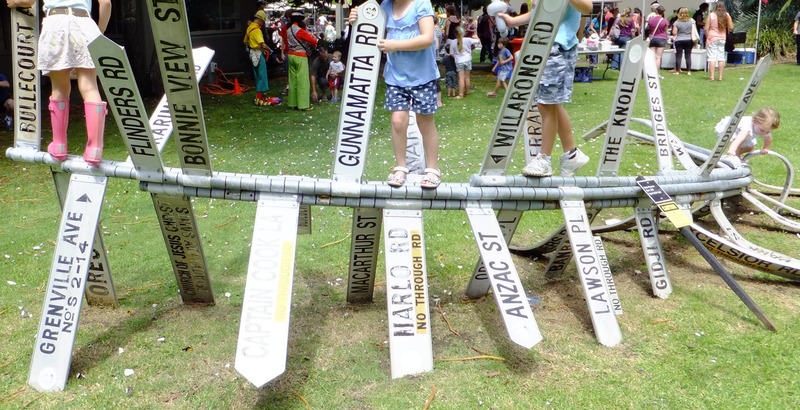 If you live in Sydney and would like to see some street art in the making, head to Hazelhurst Gardens, Gymea on Friday the 15th of February, 2013. 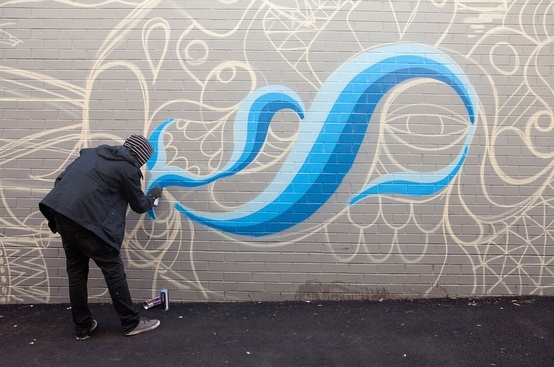 Starting between 10 – 11am, Beastman will be spray painting a mural, where it will remain until April 1. 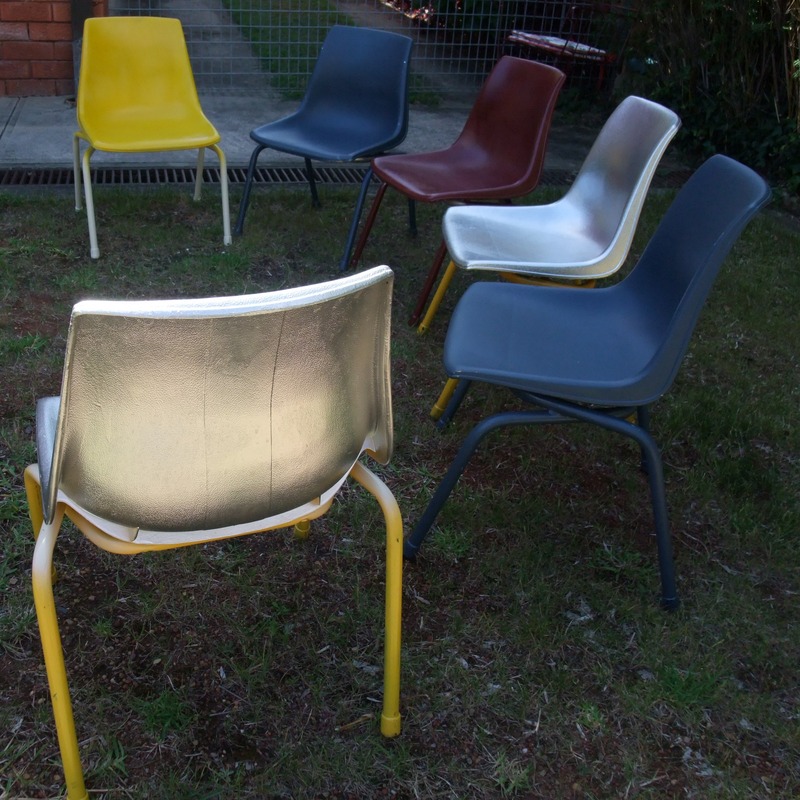 I would love to go, but find it increasingly difficult to get out of these chairs! 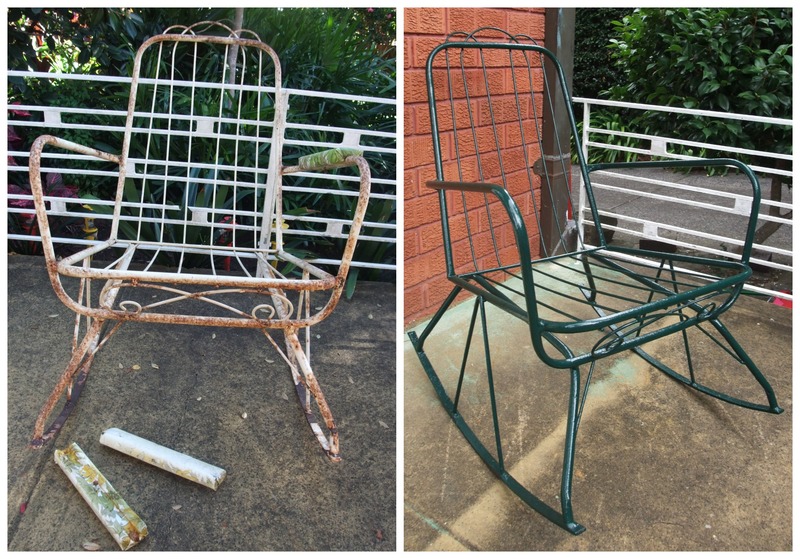 Categories: DIY, Paint, Refurbishing, Spray paint | Tags: Spray paint, Vintage chairs | Permalink. When you look back on your life, and ponder the choices you have made, do you have one that you wish you did differently? The one that REALLY stands out from all the others? The shining beacon of all clangers? The big one for me was NOT being an audience member on an Oprah show. Not just any Oprah show but one specific one. Over 2 years ago she did an ‘Australia’ piece. They were looking for Aussie butts on seats for a story on ‘Up and coming Australian Designers.’ Sadly I declined the chance to go as had just moved to Chicago and didn’t know anyone I could entrust my daughter with. 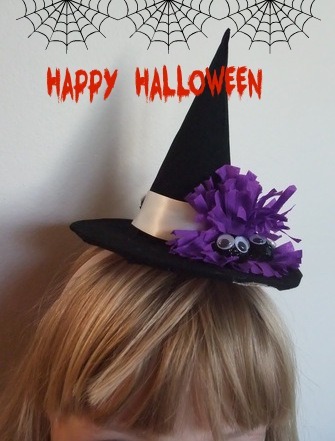 The offer of leaving her with hair and make-up just didn’t cut it! Turns out the fashion story was a pfaff. 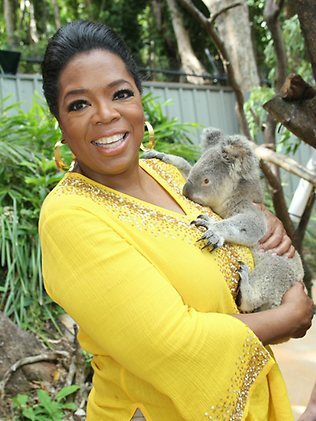 We found out later that in her last episodes, Oprah went out with a bang! 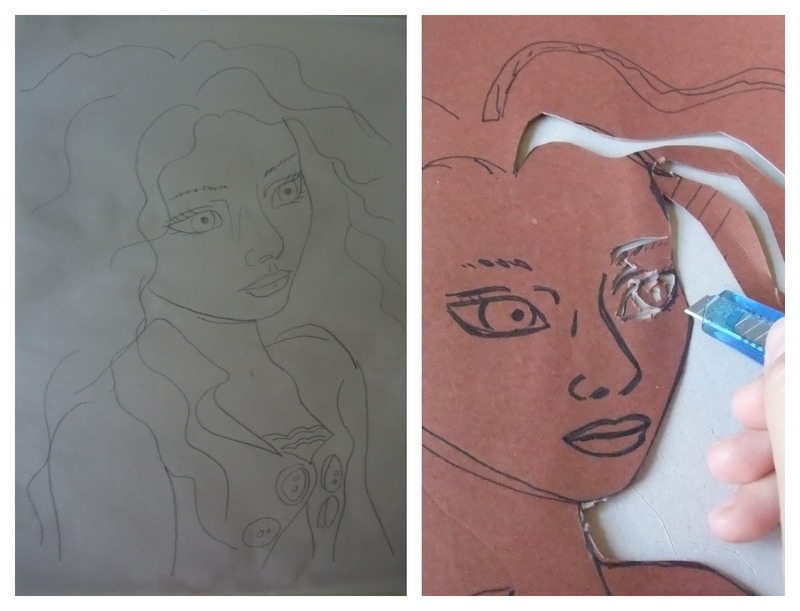 And this was one of those…. every member in that audience reached under their seats and found they had won a trip to Australia! In my next life, this is another thing I would love to do…..to be a Peacock Painter! 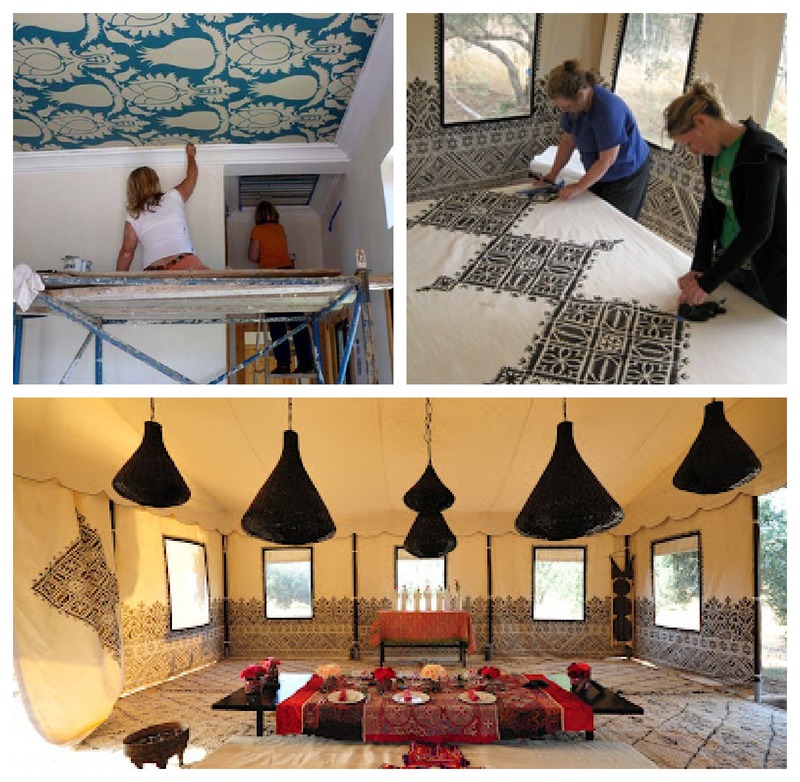 Since 2008, this amazing group of women have made annual pilgrimages to Morocco to stencil the Peacock Palace, a boutique hotel in Marrakesh. 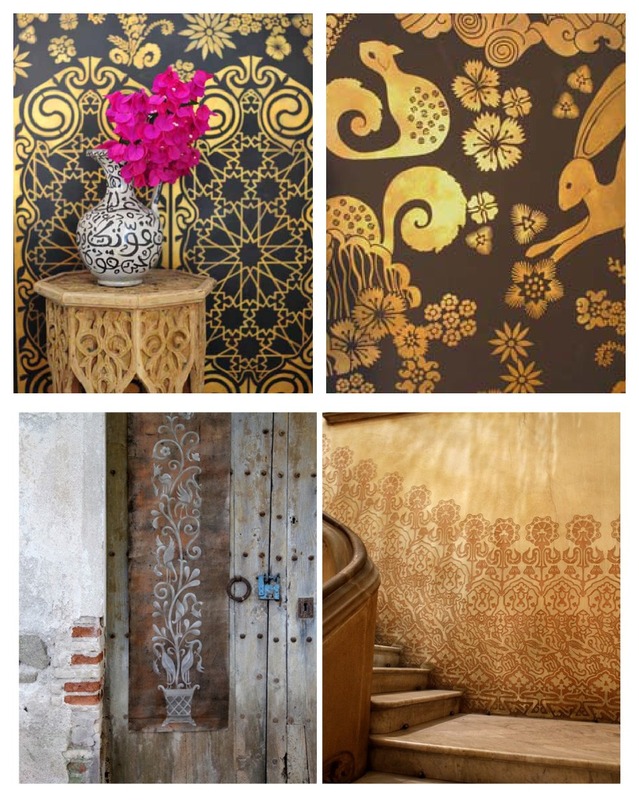 Alas, a schmuck like myself has to contend with stencilling furniture and childrens décor. 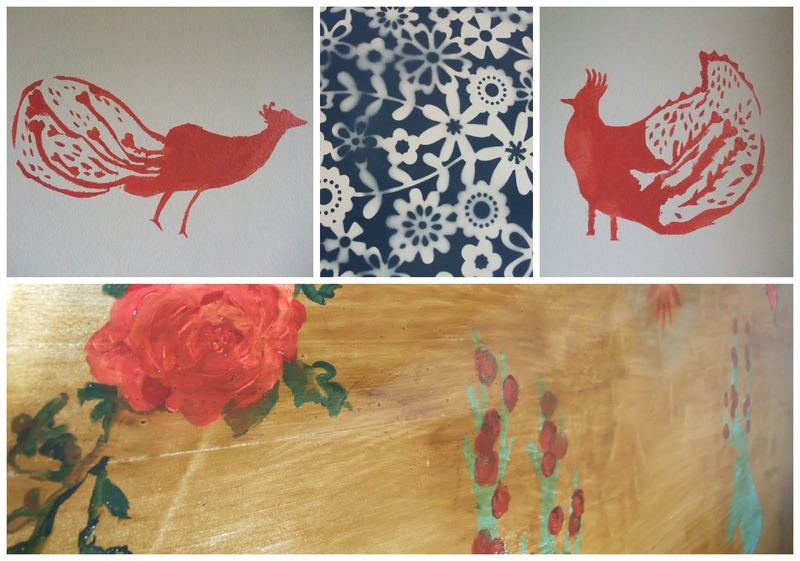 Below are photos of my efforts using stencils in a much less exotic manner! 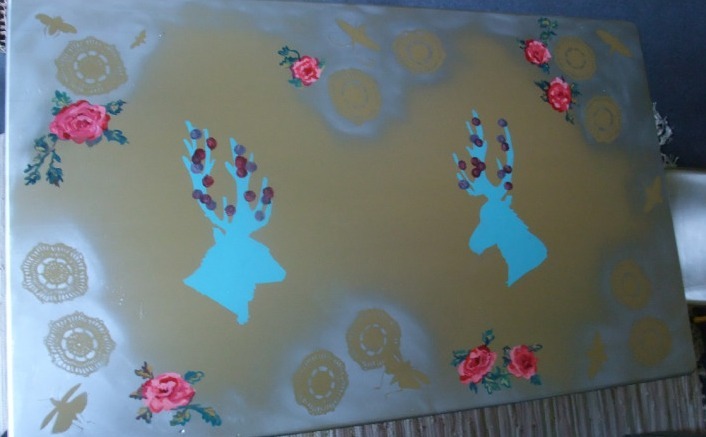 Categories: Art, Craft, crafty, DIY, Paint, Refurbishing, Spray paint, Themed | Tags: decorate, DIY, Paint, Spray paint, Stencil | Permalink. Nonsense literature is a beguiling form of storytelling as humans desire to find meaning everywhere, in everything, even when none exists. Songwriting is also a form of storytelling, and so is open to nonsense lyrics. The B52’s wrote a hit song in 1978 called “Rock Lobster.” It’s jam packed with nonsense lyrics, bopping, banshee shrieks and beehives to boot. 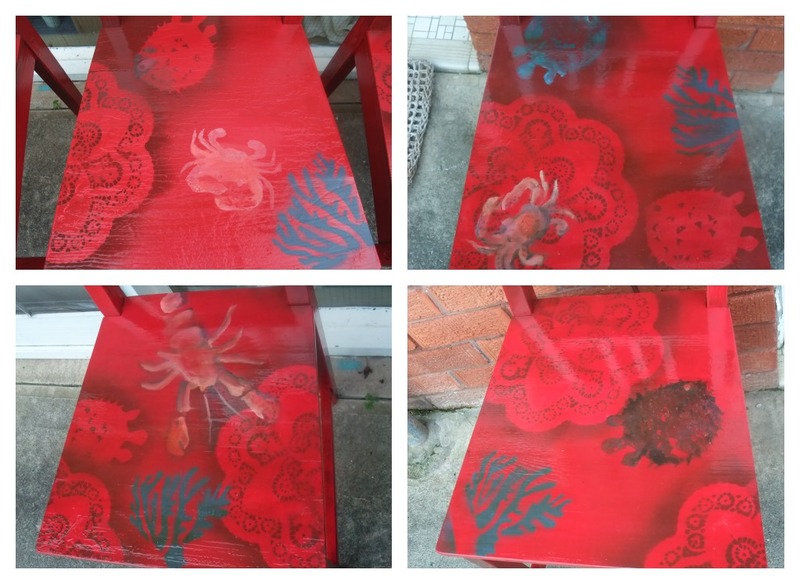 Indebted to the joy of nonsense poetry and the humble rock lobster, I refurbished a plain timber set of chairs “Rock Lobster” themed. 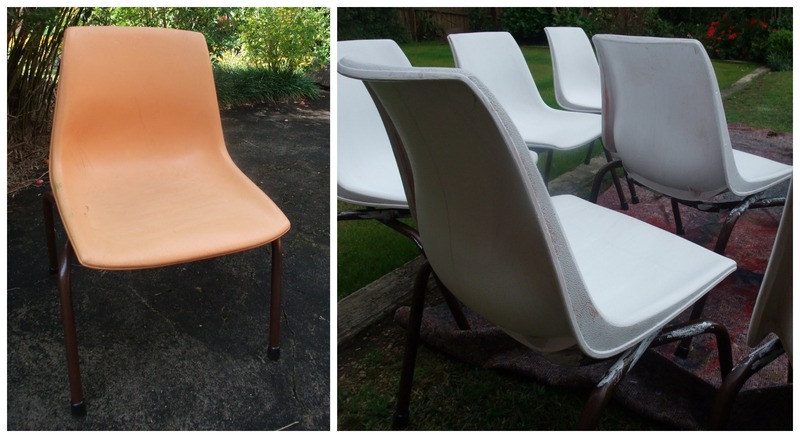 I had previously painted the chairs in an Indian Red indoor paint which was not holding well in the great outdoors. Sanded off the flaky bits and repainted all chairs with a more durable Cherry red liquid killrust. 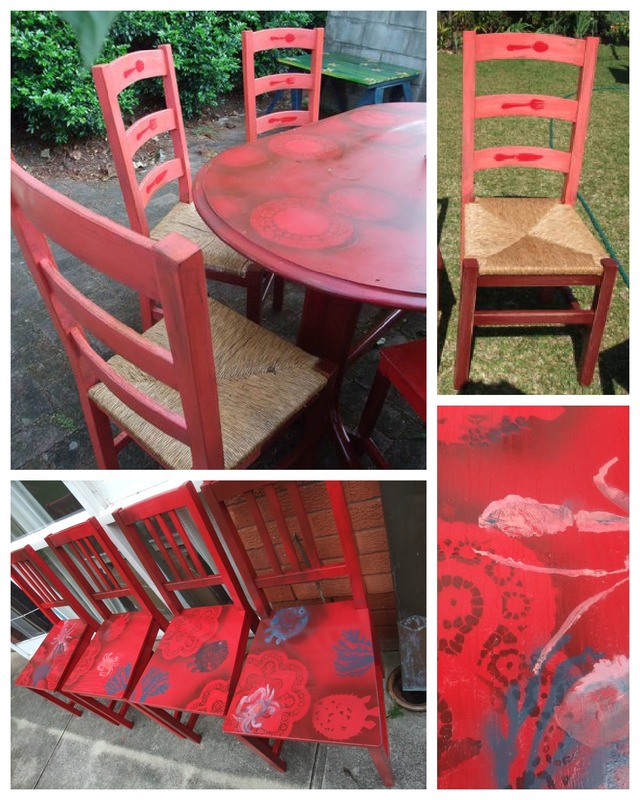 Loosely glued doilies to chairs and spray painted over them with Indian Red killrust in a can. 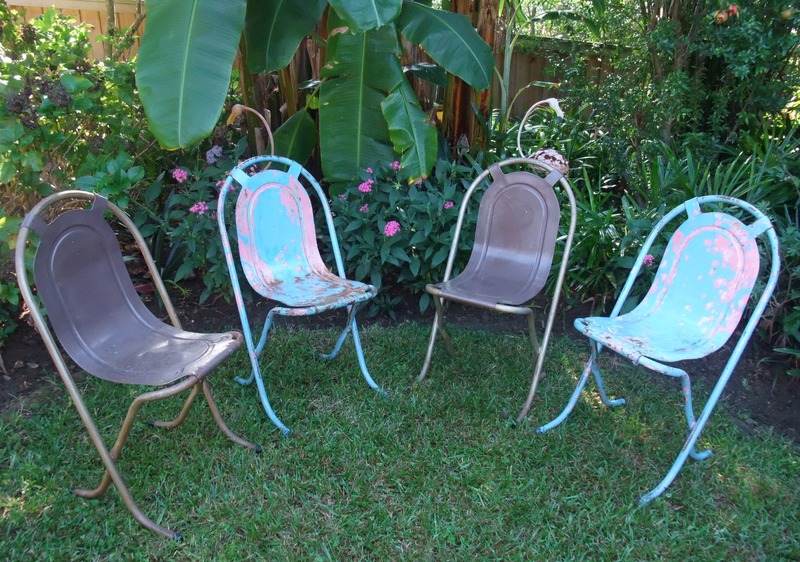 Loosely glued handmade coral stencils to chairs and then spray painted over them with killrust in a can in Ocean Blue. 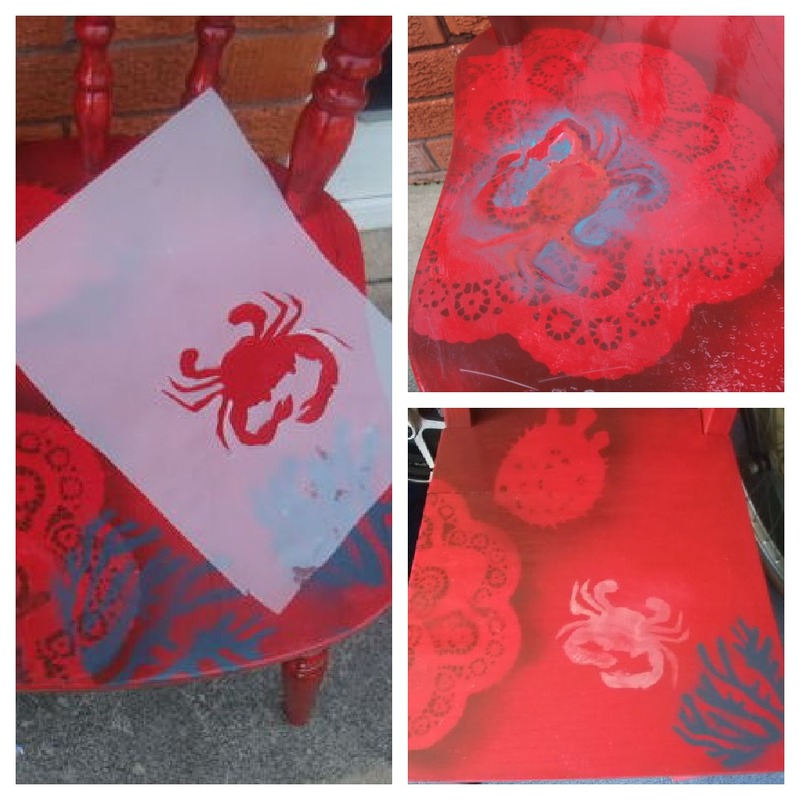 Loosely glued the lobster, crab and puffer fish stencils to chairs. 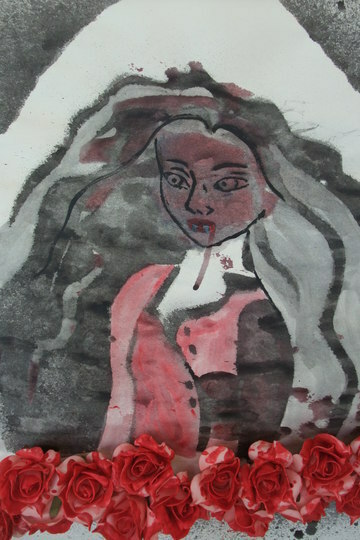 Painted inside stencils with oil paints. Now my BBQ setting is all ready for summer snags and sizzles! 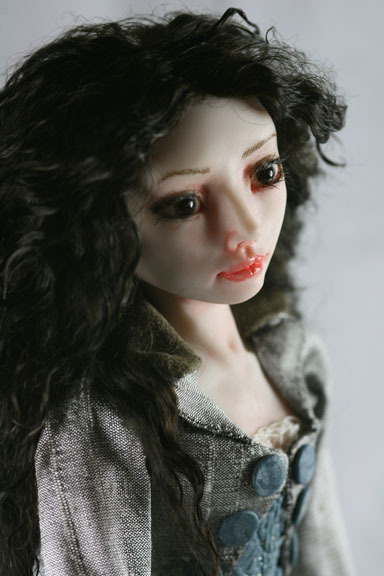 Categories: Art, crafty, DIY, Paint, Refurbishing, Spray paint, Themed | Tags: DIY, Paint, Spray paint | Permalink.